A reasonably early start for 08:51 TFC-BHM was required due to Herself having a prior appointment and Himself wanting to get 10:55 BMO-MYB without fail. Which I obviously did, with all that time to spare! ‘A Shropshire Lad’ (67012) propelled, and very nice it was too in the ex-Wrexham and Shropshire refurbished Mk 3s, now with added plug doors. The free Wi-Fi more or less ground to a halt after Banbury when the train was completely wedged, but that was no great hardship. Aeons to spare then as my flight’s not until 18:35. Accordingly repaired to the Metropolitan where an indifferent beer (surprisingly, as it was Adnam’s Explorer) was served in indifferent condition and at a high price. I’m really going to have to give up on the Metropolitan – admittedly I only visit now and again, but one pint of Mauldon excepted (3.7.10) the beer’s been consistently mediocre. So away to the JDW at Victoria by bus 82 instead. [For us geriatrics with bus passes, some of the Central London buses are as good a sightseeing tour as you could ask for]. Today’s the opening ceremony for the Olympics and London’s packed with all sorts of official helpers, traffic lanes, messages from Boris on the bus, flags, you name it. It’s infectious and you can’t help feeling a bit of excitement. As for JDW – well, it seems to try a lot harder than the Metropolitan but the beer (Pure Gold) wasn’t very exciting. Outside at Victoria to discover the bus service in chaos because of a taxi drivers’ demo at Hyde Park Corner. On the opening day of the Olympics ... enough said. [Despite this, writing my notes up on the day of the closing ceremony I reckon Britain’s done itself proud and while the PM’s ‘under budget’ claim seems to come with a little, er, flexibility attached, it’s been a terrific 17 days]. District Line to Barons Court for the cross platform change to the Piccadilly [I’m a lazy git at heart, and one who’s under threat of knee surgery too ...]. I got on a fairly lightly loaded train for T5, dived out (foolishly as it turned out) for a breather at Northfields and then had to endure sardine conditions as there was a long gap between the stifling but fairly empty train and the next one to T5. Smoothly through T5 and a long fester until my 18:35 flight, partly occupied by a fairly disgusting ham/cheese Panini and a possibly more disgusting pint of the house beer. [No-one could question the persistence of my support for JDW but they might well question the reasoning! I can only say that three of the four nearest to my home are consistently good, and the fourth is better than any of today’s three]. Punctually loaded on to a very full Airbus, to be told we’d be delayed 10 minutes leaving the stand. Which we were. It then took a further 20 until take-off at 19:05 and as is the way of these things, when Cap’n said we’d got another 4 aircraft in front of us and would be another 5 minutes or so, we were next but one to go. Only 5 minutes or so late at Tegel, quickly through immigration and on to an X9 which I decided to get to Ernst-Reuter-Platz to minimise U-Bahn changes and associated walking. The previous stop is Quedlinburger Straβe which duly came up on the display and the bus stopped. Nothing happened for a moment, then the driver came back and chucked off two yoofs, for reasons unknown. [Not for the first time, I was surprised how calmly they took this. In the UK it would, I am sure, have caused quite a rumpus]. Off we went and I duly got out at the next stop. Quedlinburger Straβe. Served me right for not trusting the display, and I had to wait, fortunately only 10 minutes, for the next X9. No problem thereafter, homework had been done and I was soon in a very, very hot hotel watching the Olympic opening ceremony on the television. The German commentator appeared as bewildered as I was. Hopefully that’s the last use of the O-word for a while – depends what happens on Monday. Why choose the 05:39 to do the Halensee Kurve, not the 05:59 or 06:59? Who knows, but it might stand me in good stead. Out of bed at 04:20 for a very welcome shower, then by U-Bahn to Bismarckstr. 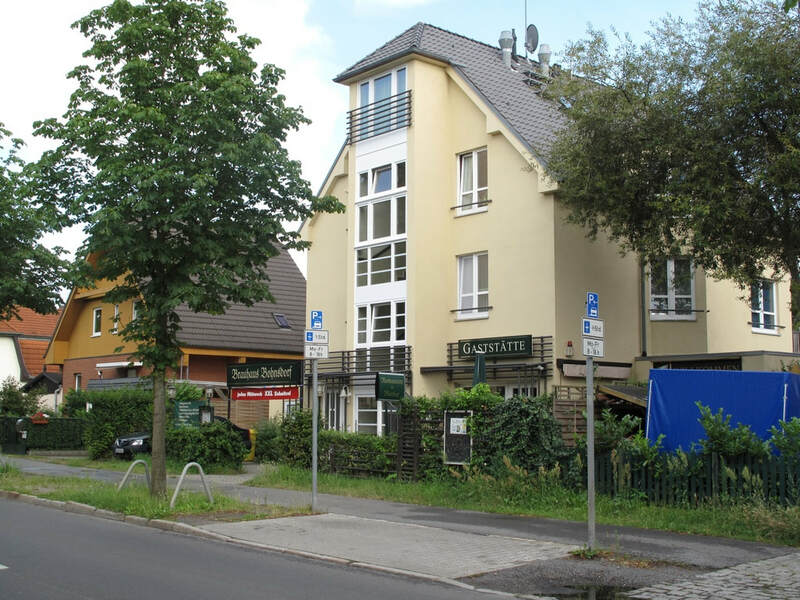 and Wilmersdorfstr. For Charlottenburg. The 05:39 was booked and on the display as P7. I duly settled down to wait, noting a train arrive on P5... The displays ticked down ... when the P5 one reached 20 minutes, off went the train, to both Halensee and my great annoyance. Nothing for it but to go over to P5 and wait for the 05:59 which appeared, on P5, at 05:54. The Halensee Kurve was duly done anyway, and a very good curve it is too. Single line, and joins the Ring at the north end of Halensee station (so it stops there soutbound on the northbound/clockwise platform, confusing everybody!). For the true fanatic it must then do a crossover but that’s too much detail even for me. With 20 minutes subtracted due to The Charlottenburg Misunderstanding (one which the late Robert Ludlum didn’t write) the breakfast break was looking too short to get back to the hotel so I got the next S41 to Gesundbrunnen for a mayonnaise baguette with a little ham, courtesy of the DB shop. 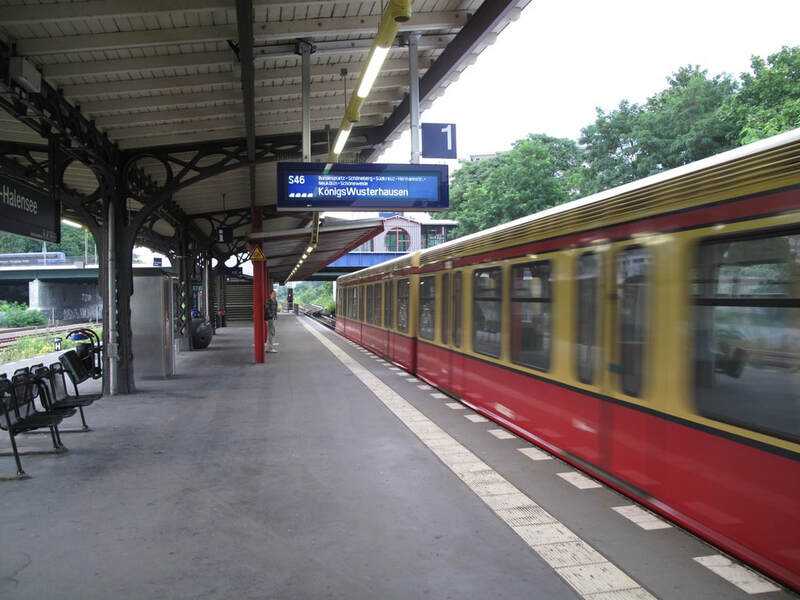 [I’d been foolish/unobservant enough to imagine Gesundbrunnen was big enough to have a station buffet of some sort].Ticket purchased (it cost more than my Berlin day rover) I settled to wait for 07:29 IC to Lichtenberg via, obviously, the ‘main’ (non S-Bahn) lines. Modest disaster as the 07:29 showed 35 late thus putting the day back by an hour. It eventually turned up 35 late as promised, and the wrong way round – hence the delay, presumably – but did at least do the track with a particularly satisfactory curve down from the Ring south of Frankfurter Allee. Mad dash to Südkreuz via Ostkreuz (huge and new upstairs, still some of the old downstairs including the tiny cobbles and the snack bars) and the Ring. It was to no avail as I missed my (planned 26 minutes) connection by 4 minutes. Stuck for nearly an hour, I had a ride up to Potsdamer Platz just to occupy some time. The southbound train to Elsterwerda was 10 late so I had plenty of time to admire the hideous architecture. No, that’s not fair from someone who knows New Street well. Down to Blankenfelde eventually, to scratch in the north to east side of the Genshagener Heide triangle and the west to south side at Glasower Damm. A pause at Blankenfelde was occupied by a Hasserode purchased at Potsdamer Platz – early maybe, but I’ve been up for over 6 hours! 10:37 from Blankenfelde to Schönefeld was the first punctual train of the day, and about time too (well, first main line train. The U- and S-Bahn were fine). It also made absolutely sure of the south to east curve at Glasower Damm. The north to south ‘main line’ thereat is out of use and becoming very overgrown. 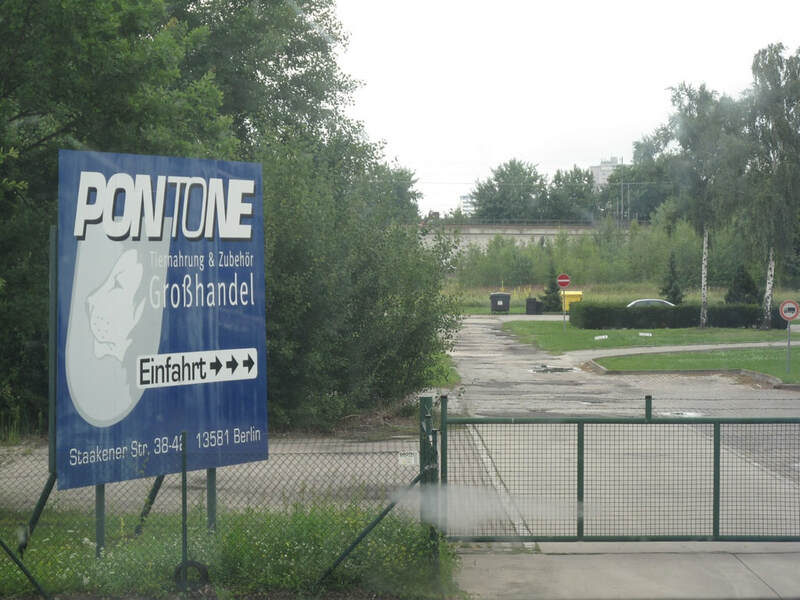 As indeed (partly) is Schönefeld, with at least one pair of tracks out of use although with the delay to BBI it’s still quite busy. The RB22 for Golm and Potsdam was a 422 – normally I’d heap scorn on such a thing but today the air con’s working! 232 534 passed through light engine, harking back to the old days. Off to Golm – over the top at last! I’d pretty much decided to retrieve some time by abandoning the Wustermark west curve until tomorrow, so stayed with the kart which reversed and ran down to Potsdam Hbf via the north to east curve. On arrival at P-Hbf I discovered the 12:03 to Werder with a man of steel 1-minute connection on to 12:15 Werder to Berlin Charlottenburg and points east. Nothing venture – not only was it only a few seconds late but the RE was 5 late so it made easily in the end. Golm W-N and Wustermark S-E duly done. Still on the goods lines past Elstal though we seemed to go between the yard and the main for a while east of there. Main drag into Spandau unfortunately despite having stayed on the slow lines past Staaken. 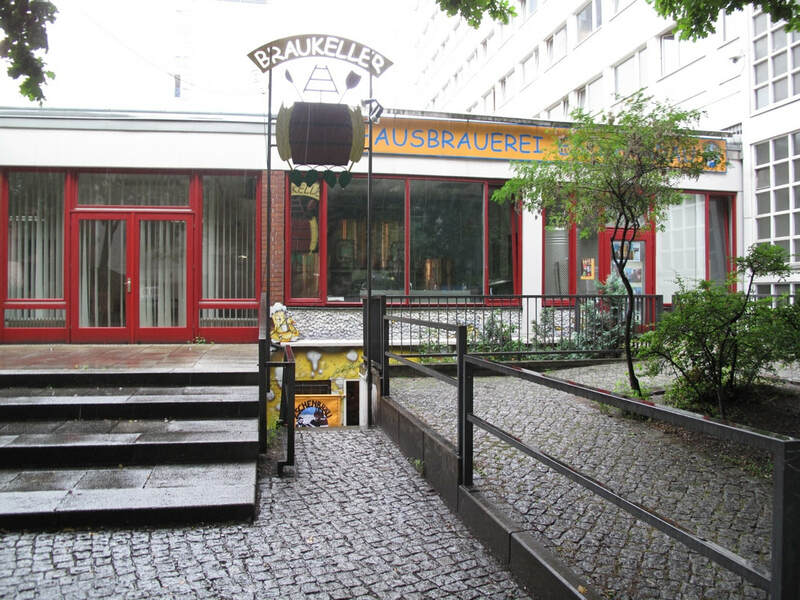 I’d planned to bale out at Charlottenburg but soon realised that Zoo would save me a walk and a U-Bahn change so I baled at Zoo instead for U9 to Turnstraβe and Brewbaker, which is a tiny brewery tucked in the north west corner of the Arminiusmarkt, a market hall of the conventional kind. Nice malty unfiltered pils, and an IPA very much resembling the real thing and of lethal strength (one of the locals kindly offered me a sample in a schnapps glass measure). No T shirts left, sadly. After this shock to the system, back to Zoo on the U-Bahn then S5/S42 to Ostkreuz and Frankfurter Allee for a mosey up to Schalander. I found both pub and beer rather uninspiring, but what do I know. Back to Frankfurter Allee and (by U-Bahn) Lichtenberg in time for a refuel at McD’s before joining ODEG’s trapezoid window thing to go to Königs Wusterhausen for some ‘just in case’ Grünau triangle bashing. It ‘didn’t half go’ too once off the Außenring. Next S-Bahn back from Königs Wusterhausen to Grünau, then the splendid 363 ‘hospital’ bus to Sausenberger Straβe for the Brauhaus Bornsdorf brewpub. This (the 363) was fitted with all the usual bus bits of displays, announcements etc., but was basically a minibus equipped to carry people of limited mobility etc. Excellent – compare and contrast with the 44 to PRH [my local bus service/hospital]. Couldn’t quite pigeon-hole Brauhaus Bornsdorf. It’s very smart, completely empty when I arrived at 17:00, The staff (or owners?) in evidence seemed disinterested, were pleasant enough but didn’t really seem to be on the case. The beer was difficult to pigeon-hole too. I had the helles but it was a bit darker than usual and came in a weizen style glass. Nice though, and I’ve nothing at all to complain about. Back to the S-Bahn on the more conventional 163 and thence to Schöneweide (“curve” bash) then Ostkreuz and Warschauer Straβe, finishing up with M13 tram to Hops & Barley in Wühlischstr. This is another odd one, a converted shop in an unlikely looking suburban street. Nothing wrong with darker-than-usual weizen though, and they had a T shirt! 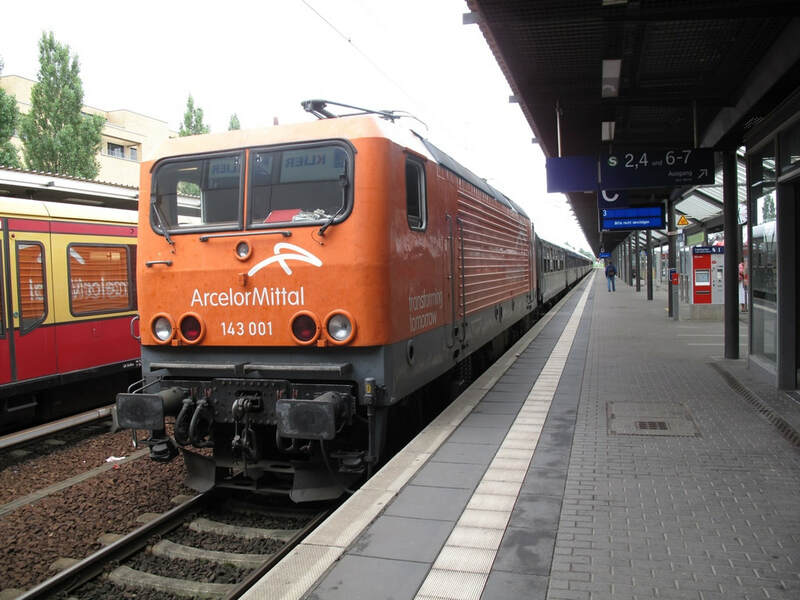 Out to Lichtenberg yet again – I keep thinking this must surely be the last time – for OE60 at 19:44 to Bernau to confirm the Karow S to E curve. I can’t believe I didn’t do it ‘in the old days’, but there you are. 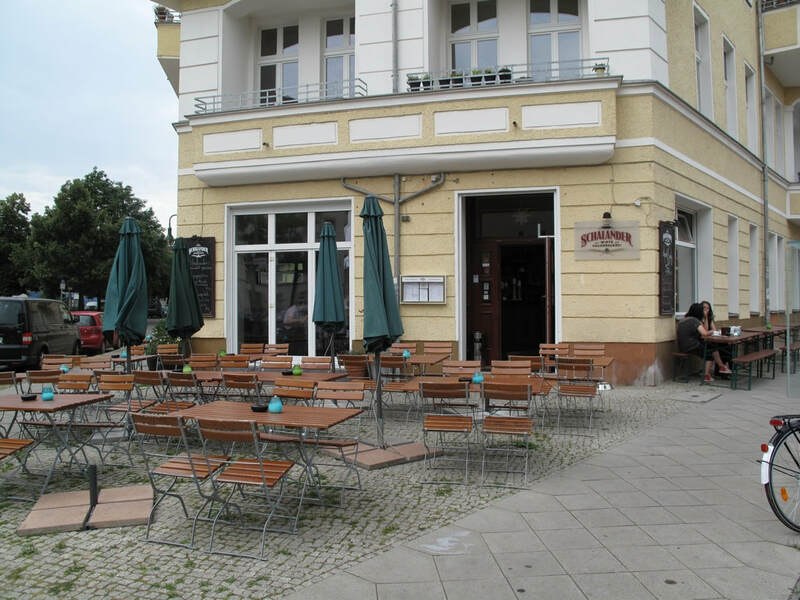 Transfer to Lichtenberg was by tram M13 because it stopped outside the pub, and S75 from Warschauer Str. to Lichtenberg. Back to Berlin Hbf on an RE. E to W ‘straight across’ at Karow appears to be single line (as is the S to E one from A-ring to the Bernau line). Looked in at Hopfingerbräu at Hbf, whose ridiculous €4.10/0.4l price was reflected in the very small number of customers. This number didn’t include me. On to Savignyplatz where I called at Dicke Wirtin. A fine old pub but where you could sit you couldn’t get served, and vice versa. By this time I’d realised that total exhaustion was setting in and beer would make it worse so took the sensible option and the S and U-bahn, and retired to the hotel and bed! Woke to heavy rain and, mercifully, slightly lower temperatures. Excellent breakfast at the Hotel Concorde, definitely a ‘would stay again’. Despite meeting the coach party head on, the staff were cheerful and on the ball and supplies of everything (including meatballs, a first for breakfast) were maintained. Possibly the first time I’ve had to wade to a station. 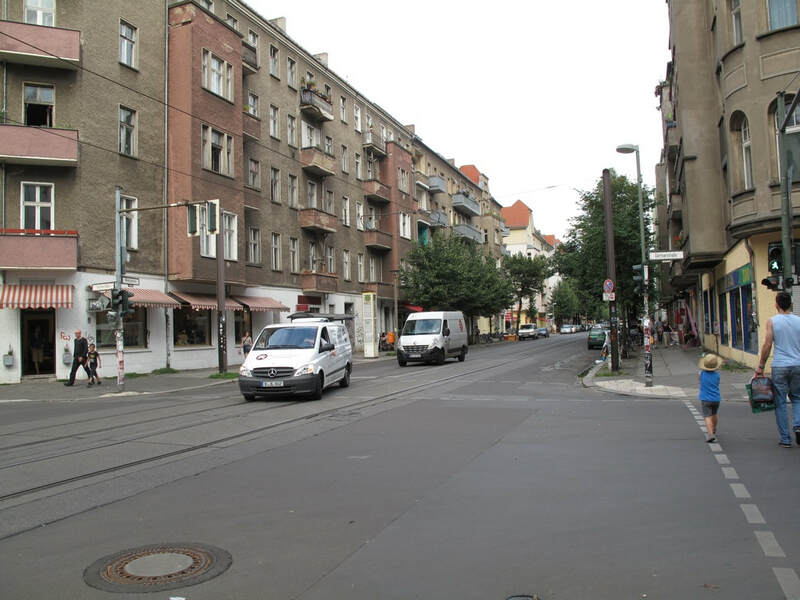 Several roads and footpaths were awash en route to Messe Nord S-Bahn and the situation wasn’t helped by the building site occupying the street on the direct walking route, requiring a circuitous and poorly drained diversion. To be fair it was really chucking down rain! Still raining at Gesundbrunnen but it petered out just before 09:27 to Oranienburg and Stralsund arrived. This was 5 minutes or so late, causing some (unjustified, as it turned out) concern about the 9 minute connection at Oranienburg. Out via Karow W-N (single line again I think) and the direct curve at Hohen-Neuendorf, back via the Lange Kurve. Karow W-N is indeed single line. 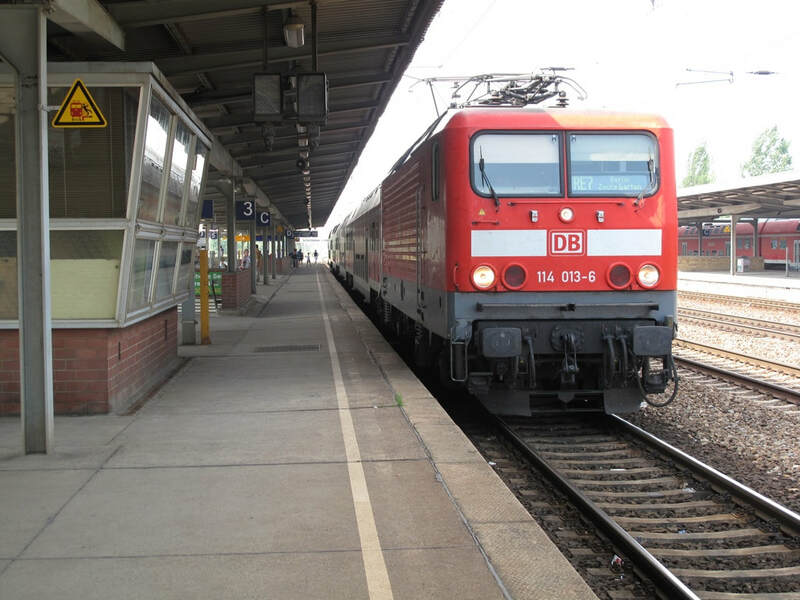 Next move was to Bernau and back – 10:38 Stralsund arrived completely wedged and I had to stand to Bernau. Even then it was hard to find a spot where I could see Karow W-E properly but I did manage that and was able to confirm last night’s ‘appears to be’. Karow W-E is single line, with the S-Bahn lines taking a separate route. Once again the REs are struggling, with 11:09 Bernau-Elterwerda 10 late. I suspect this endemic lateness of southbound REs is due to moleworks further north which I ignored because I thought (wrongly) that they wouldn’t affect my plans. Still, no harm done by them so far. The slight delay fitted quite neatly with a change of plan – the rest of the day was basically pub related apart from the Wustermark west curve which was left out yesterday in order to get back to the plan after the morning IC delay. An 11:40 arrival at Hbf was long enough to make my way up the escalators for the 11:48 S7 to Potsdam Hbf. This reached P-Hbf at 12:25, a comfortable connection on to the 12:44 143 844-propelled RB to Wustermark. This completed the track for this trip (unless I think of anything else) by doing the single line S-W curve at Wustermark. After a few minutes’ fester at Wustermark (it’s now dry and a comfortable temperature), on to a punctual RE4 at 13:32 to Jungfernheide. At Elstal serried ranks of 442s were noted waiting in the yard, presumably to replace something older, more comfortable and more interesting, but less air conditioned! I shouldn’t have made wild statements about completing the track. To my delight the RE took the southern route between Staaken and Spandau, arriving in P6 at Spandau and even making a convenient signal stop at a point where I could phot the other line for evidence! Just 3 minutes wait for the S41 at Jungfernheide and 2 for the U6 at Wedding. You can’t say fairer than that. At the end of U6 (almost literally – a few yards from the station if you pick the right exit) is Hax’nhaus, a nice enough Bavarian style pub in the modern idiom. It specialises, unwisely, in schweinhaxe. Or perhaps my overdone one was an unusual aberration. Perhaps the slightly dodgy Augustiner Helles was too. Back to Lopoldplatz on U6, to find it absolutely tipping down. I splashed my way to Eschenbräu which is indeed very hard to find. And when you do, you think it’s shut. Then you spy this narrow flight of steps leading down to a cellar under the brewery. Very friendly lady in charge though, and their weizen is to die for. Full marks, except for findability, but to be fair they do try with signs. Thence by U9 and S7 to Savignyplatz. Got served at Dicke Wirtin this time. I’m sure draught Schneider Weisse has been better than this, but perhaps memory plays tricks. Fine tourist tr... er, pub though. From Dicke Wirtin it’s a stroll back past the station to Zillemarkt, from which advantageous position you can watch the trains go by about 30 metres away. Well, you can see the eastbound main line trains anyway. Beer was supposedly theirs, I’ve had worse but equally I wouldn’t particularly want to own up to it. A very ordinary, but drinkable even to a British taste, pils. And for my farewell appearance .. . the Augustiner am Gendarmenmarkt, reached due to the moleworks by the S-Bahn to Zoo, U2 to Stadtmitte and the U6 MoleShuttle to Französische Str. This is a small and pale (well, dark) imitation of the mighty München beer hall. Infested with Reserviert signs on empty tables as usual, I had to sit at the bar. Excellent weisse, really couldn’t fault that, and cheery English speaking service. The problem is the failed (in my view) attempt to transport a local hero to a new environment. In the ‘pro’ corner – McDonalds. 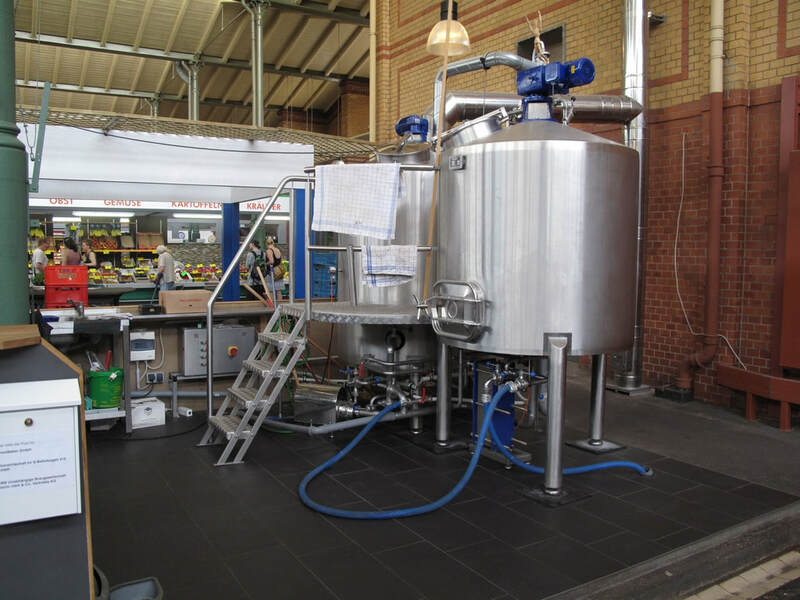 In the ‘con’ corner – Harry Ramsden, Belgo Bars and any number of failures disappearing without trace. It’s like trying to copy the Britannia at Upper Gornal into Islington. You’d make a fortune for a while (you listening, Tim?) but it Wouldn’t Be The Same. After this interesting and instructive experience, back to the hotel on a lovely summer’s eve, by way of the U6 MoleShuttle and U2. Unable to trust the alarm on the new magic phone (and I’d forgotten the trusty clock) I woke about 03:00 and eventually abandoned sleep around 04:00 in favour of a shower and an earlier than planned start to go to the airport via Jungfernheide. This spared me from having to traipse round Ernst-Reuter-Platz trying to find the bus stop. Off to Messe Nord/ICC S-Bahn therefore, eventually leaving there around 05:00. Quite a long wait – must have just missed one as they’re every 10 minutes) for the bus at Jungfernheide, this one being an X9. After chickening out of the ‘download to phone’ boarding pass yesterday I’d opted for ‘collect from terminal at airport’. There was only one snag to this concept – BA don’t actually have a terminal at the airport so I had to queue at the desk anyway. This was as nothing however, compared with the queue to get the 07:00 MAN and 07:05 LHR pax through passport control and security. Nevertheless we pushed back pretty well on time, were given a breakfast of sorts, and arrived at LHR a few minutes early. Despite all the horror stories about immigration queues at Heathrow, Olympics, national disgrace, blah, blah, I was in a queue of one person and was on the Piccadilly line by 08:10 despite having waited a couple of minutes on the platform for it. Narrowly missing 09:07 at MYB I got the 09:37 which was 5 late at Leamington but on time at Moor St (11:19) enabling me to hurtle across to New Street and get the slightly delayed (bless ‘em, for once) 11:24 ATW kart to Telford. Should be at TFC by about 12:05, not a bad effort from Berlin via Heathrow! And indeed I was, 12:04 in fact, and my kindly other half was in attendance with the car thus enabling me to get half a day’s work in to pay the hotel bill (well, some of it at least). Not quite the end for Berlin as they will presumably get the fire alarms sorted out eventually at SXF or BBI or BER or whatever it’s going to be called [2018 update: opening date now being suggested as 2021! ], at which point the new connections of the Außenring and (both ways) the Kömigs Wusterhausen line will be opened. There’s also one curve at Genshagener Heide to do, then it’s wait and see time for non-passenger bits like Biesdorf N to S. So for the moment, the plan is there’s no plan until something sufficiently interesting turns up. Dolní Poustevna to Sedlitz, for instance! Dolní Poustevna had to wait for another couple of years, but another Außenring curve became available later in 2012 so Mrs EG and I set off to Germany again in October.